Kidzania is a well-known world-wide brand in experiential learning, and they have outlets in many major cities across the world. 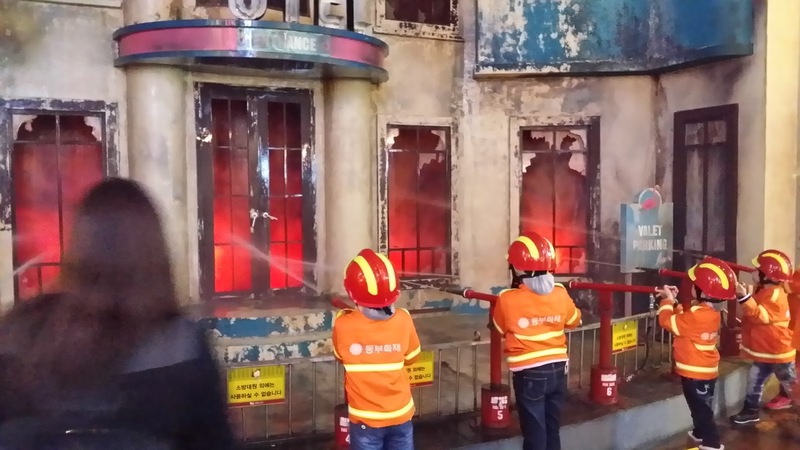 More information on the concept is available on their website at www.kidzania.com. The facility in Seoul is located right in the Lotte World complex itself just a few minutes stroll from our hotel. However, passes have to be bought directly from Kidzania and the hotel was not able to purchase or make reservations for tickets on our behalf. We recommend that you make reservations at Kidzania on popular days such as during the school holidays and on weekends to ensure you get tickets on your desired date. Be warned that admission is pricey, but since we were already here and in the holiday mood, a chance to experience this was too good to pass off. Ticketing opens at 9am for the first session at 10am to 3pm. 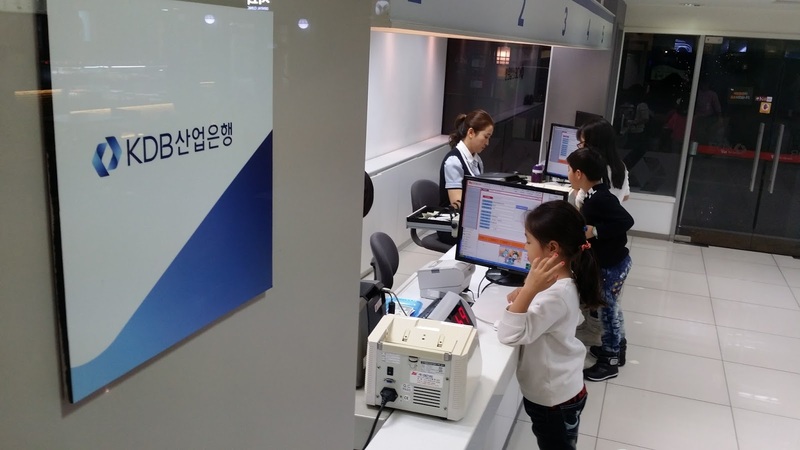 (38000 won for child aged 36 months to 16 years and 15000 won for adult) The second session runs from 3.30pm to 830pm. 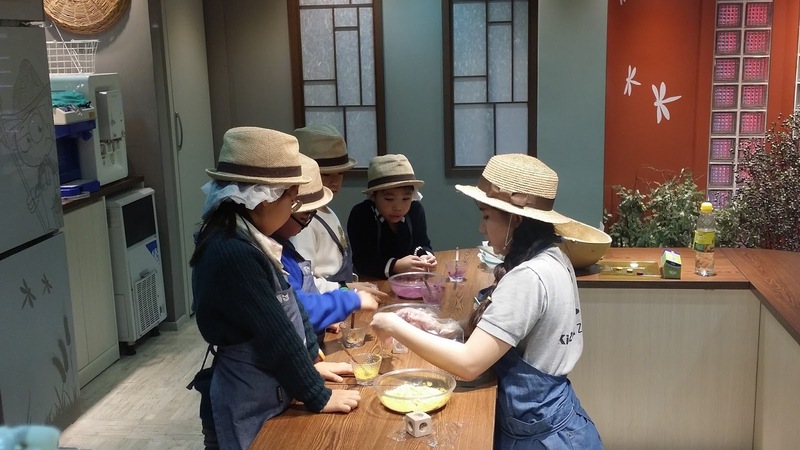 (35000 won for child and 16000 won for adult) Day passes allow kids to stay through the morning and afternoon sessions. Mummy went down to get the day passes for four kids (59,000 won each) and four adults (18,000 won each) (our littlest member, who is under 3 years, goes in free but cannot participate) at 9am. If you are a Kidzania member, you can book your tickets online. Colour codes indicating our day passes are strapped to our wrists and we get 'transported' to the Kidzania, where kids work and earn KidZos which they can use to buy gifts, deposit them into the bank for future use, or use to experience special facilities. As we enter at Kidzania Airport, we are greeted by the friendly counter staff. Even the entry tickets resemble boarding passes. 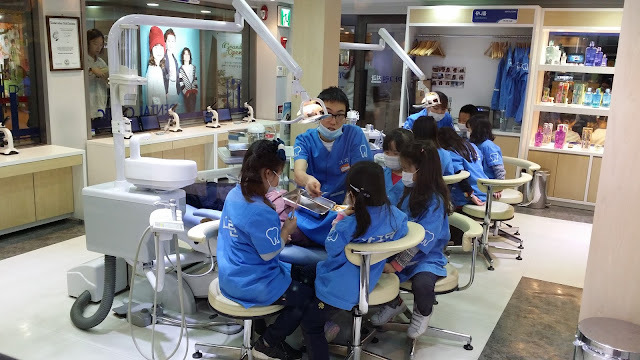 Many of the facilities are co-owned and sponsored by various partners, which provide children with a unique experience that teaches them more about that particular industry. Each facility has requirements such as minimum age. They also specify the time the next session will begin and the duration of the session. The notice also informs you of the maximum number of participants for each session. Kids can queue for their desired facility before the session starts. Some of the more popular facilities (e.g. Firefighting, Construction Worker, Air Stewarding, Piloting and Ice-Cream Making) require children to queue way in advance when there is a crowd. 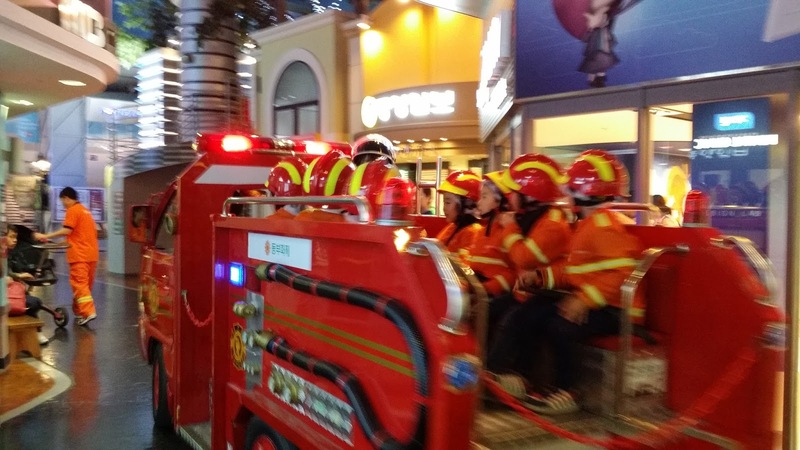 Kidzania was a three storey enclosed environment that was safe for the kids. The adults brought the kids around at first, but once they got the hang of things they were able to move around on their own. The grown-ups established a base outside the Kidzania bank at the cafe and the kids knew where to find us when they needed any help. 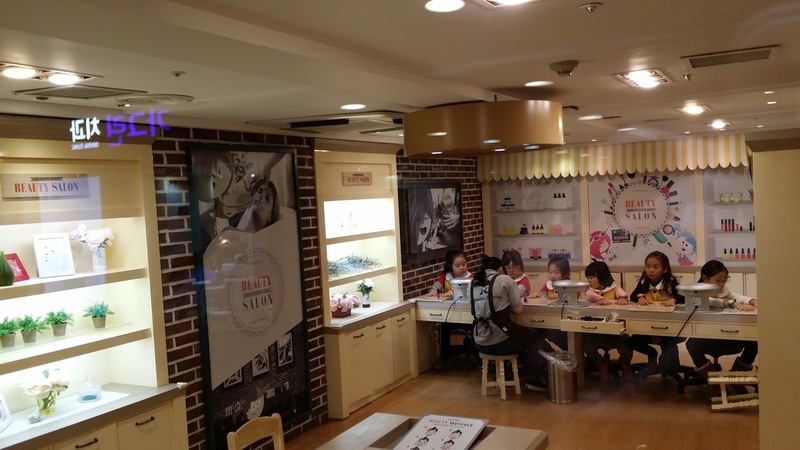 Most of the Kidzania staff know some simple English and would try to explain the instructions to our kids in English. When they couldn't manage, they would get Mummy to go in and translate. Most of the time, the staff would manage with sign language and the kids would follow what other kids are doing. However, it would be more beneficial for the children if they were able to understand the explanation and instructions simply because that is where the learning is. Nonetheless, the kids had fun trying to overcome the challenges themselves. 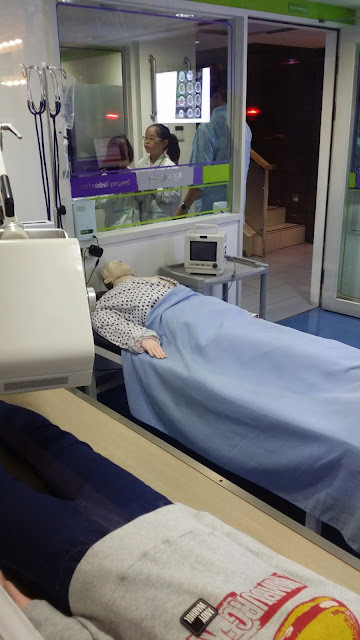 Trainees working with a mannequin to learn about oral hygiene at the Dental Clinic. 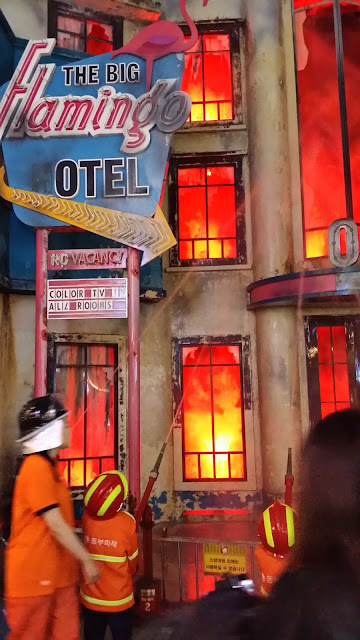 Flaming-o Hotel is in flames! The heroes step up to put out the 'fire'. 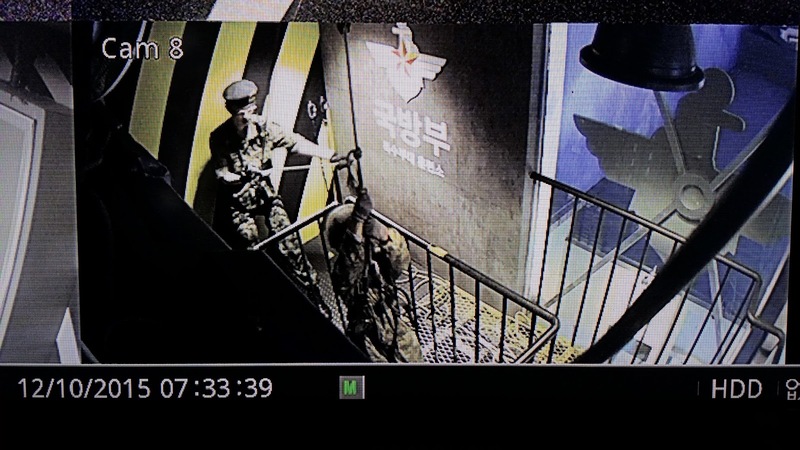 Guardians can watch the Special Force cadets undergo abseiling training inside the facility via a close-circuit television monitor. 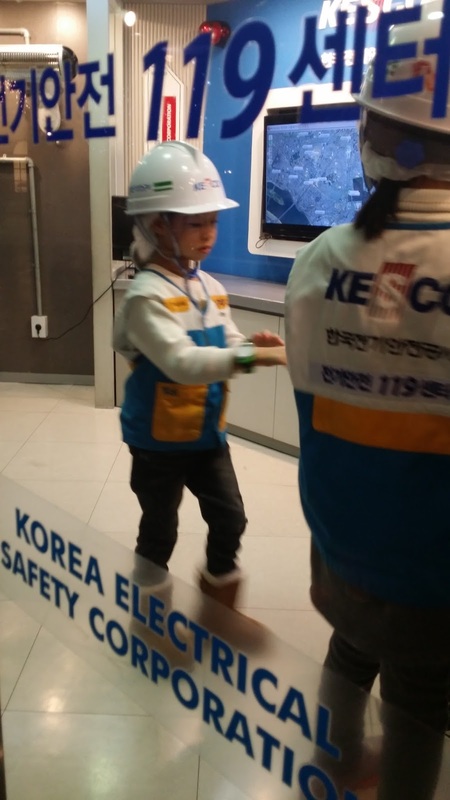 Learning about electrical safety and the KESC's role in keeping the city grid safe. Getting briefed before undergoing nursing training at the Hospital. 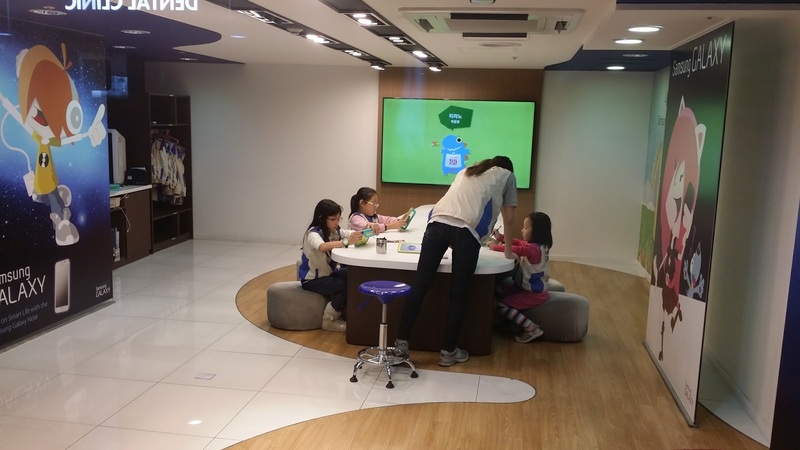 At the Samsung Research Centre, the kids learn about service support and research using tablets. Learning about organic food cultivation and preparation at the Agriculture and Farming facility. 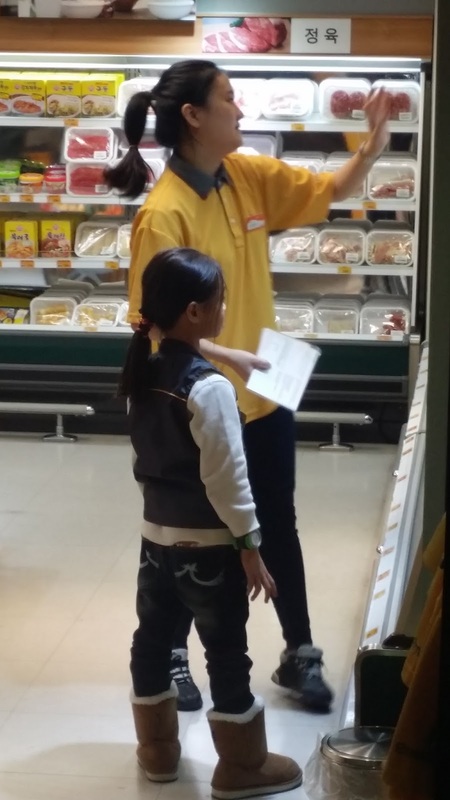 The rookie gets a briefing on her new role as a store manager in the supermarket. ... ice-cream! 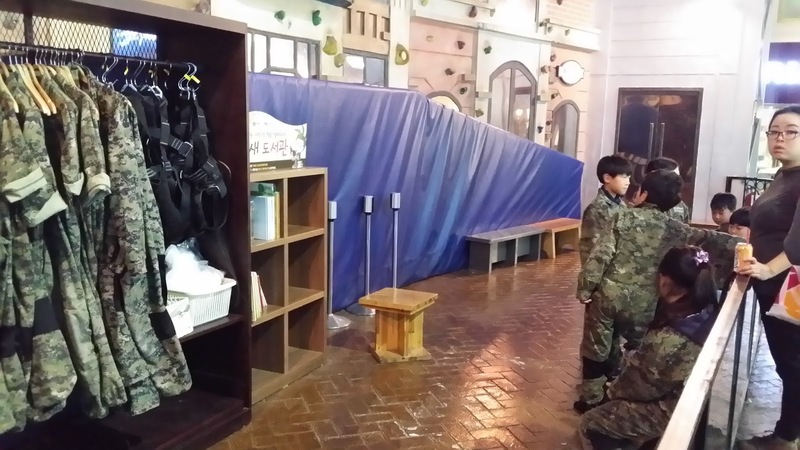 Most food facilities require kids to pay 15 KidZos to participate. In return, they get to take away their very own food and ice-cream dessert creation. Air-purifier research facility. After some hands-on in the lab, they were brought out to test the 'real' air. The kids trying their hand at being illustrators for a children's story book. Their creation were made into a book which they brought home. Realistic training is supported by life-sized mannequins at the Dental Clinic. Pilots getting ready for their flight simulation training. Kids even made their own Vitamin C.
At the Dunkin' Donuts facility, the kids create their own donuts! 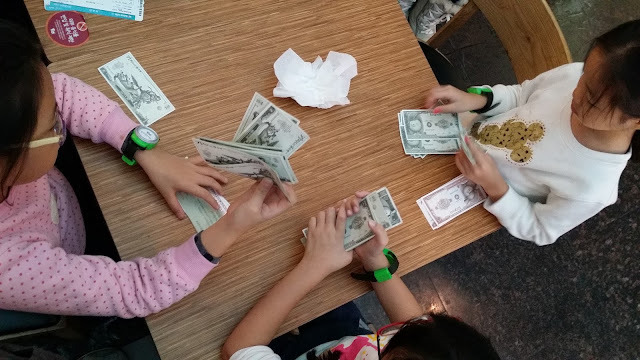 After a hard day's work, the kids count their earnings and decide how much to spend and how much to save. Depositing our savings in the KDBank. 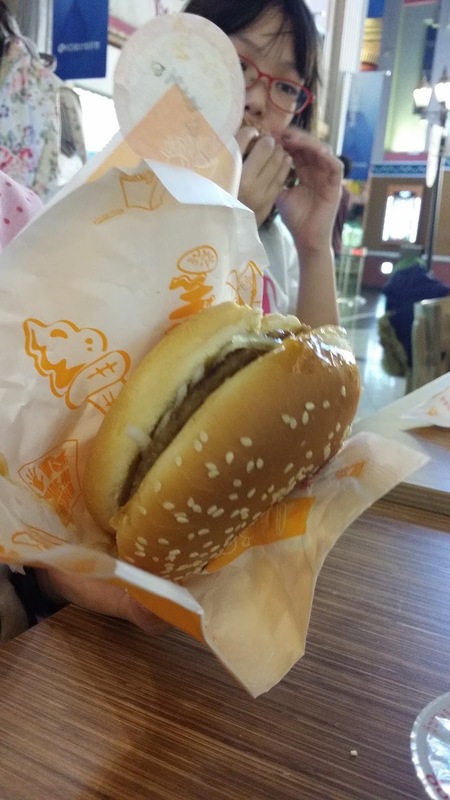 We used the ATMs to withdraw th'e depositied 'cash' when we needed it to participate in certain facilities such as ice-cream and donut making. 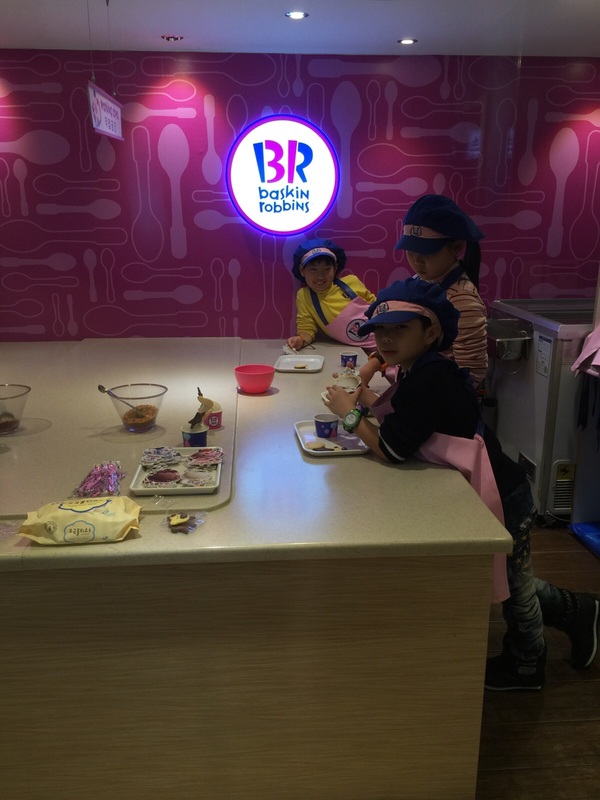 The savings can be used at other Kidzania facilities around the world too. I hear they are opening an outlet in Singapore, so the deposited KidZos may come in handy. The day passes allowed us to spend the entire day there and we made the most of it by staying all the way from it's opening till it closed at 8.30pm. In-between, we patronized the cafes and popcorn stands to keep hunger at bay. The restaurant served up set meals for the kids' lunch. After the closing, we swung by Lotte Mart to pick up some sushi and kimbap rolls for dinner. It had been a long day, but we were glad we stuck it out as the kids had so much fun and opportunities to experience many facilities between themselves. They swapped stories and made recommendations to each other regarding the facilities, bonding closer in the process. In hindsight, much of the learning opportunities were lost in translation as many of the facilitators could not speak English. However, it was clear that the children enjoyed themselves greatly, judging from the expressions on their faces at the end of the day. A great place for kids to have fun and learn something at the same time.